A Streamlined Integrated Solution For Your Fluid Handling Challenge. Unique process challenges require uniquely designed process solutions. Our standalone process skids are designed to help customers solve challenges as efficiently as possible. With both pre-configured and custom-designed skids available, we have the ability to isolate, simplify and streamline numerous fluid-handling processes. Anderson Process skid development services leverage decades of fluid-handling experience in the industrial and manufacturing markets. Not only are we familiar with common industry challenges that mass-market equipment solutions simply can’t solve, we have a team of in-house engineers with the expertise needed to develop the ideal solution for any fluid handling challenge. Our factory-trained on-staff applications engineers work closely with customers to fully understand the full scope of their processes and design skid systems that seamlessly integrate within processing lines in food, beverage, chemical, power generation, pulp and paper, paints and resins or OEM operations. From small, portable cart systems to larger skid-mounted systems, Anderson Process’s expert equipment professionals will develop a skid system that enhances overall processing efficiency and drives production output. 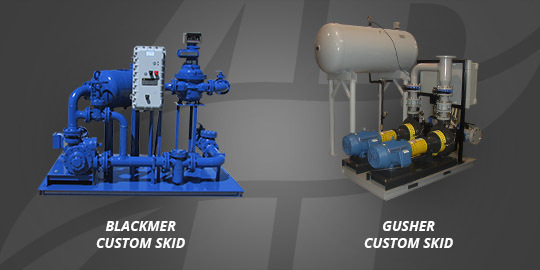 Whether you need a mixing, transfer, chemical feed or other pump skid, our custom skids are designed to meet your operational footprint limitations, as well as simplify serviceability. Anderson Process sources all of its custom skid components, including operating equipment and controls packages, from trusted manufacturers in order to develop a total package that will offer reliable, sustainable performance. Anderson Process provides documentation, support materials and primary technical support for all of its custom skid designs.